— Sesamoiditis! What Exactly Does This Mean? You have recently joined a dance class, which is quite high impact and repetitive on your feet. After participating for the last few months you have started to develop pain in the bottom of your big toe, which has progressively become worse within the last week. You cease your dancing classes in the attempt to resolve your pain but find even walking has started to cause you an issue. Your friend suggests that you visit your local podiatry clinic and after assessing your feet and sending you off for some imaging, you have been diagnosed with sesamoiditis. 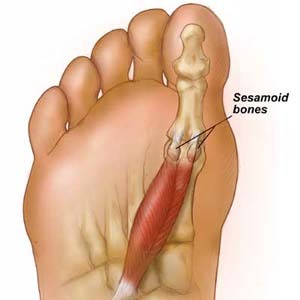 The sesamoids are located at the bottom of your 1st big toe joint and can be seen as two small bones about the size of peas which are connected to the flexor tendons. The sesamoids function are to act as a pulley, to allow movement within the big toe joint. Quite often those who participate in activities such as Ballet, catchers in baseball, softball or running are more prone to injury due to the positioning and movements that are involved with such activities. Those who develop sesamoiditis will have developed an inflammation as a result of the repetitive activities. In some cases, when not treated early, you may develop a fracture within the sesamoids due to continuous pressure through the big toe joint. Risk factors that are often associated with sesamoiditis include; high impact activities, high heeled shoes, foot deformities, poor foot bio-mechanics and inflammatory arthritis. More often than not you will experience pain underneath the big toe joint, swelling and bruising as well as difficulty bending or straightening the big toe. If you have been experiencing any of the following symptoms, make sure you book in to see one of our skilled podiatrists today for an assessment and adequate treatment plan to get you back to the activities that you enjoy most.